Keeping our sky dark goes much further than allowing both professional and amateur astronomers to do their research work and for all of us to see the stars. We should realize that sky glow is also a visible sign of unprofessional lighting that wastes energy and as such contributes to CO2 emissions and the connected climate change. When we consider restriction of light pollution we should see it in the context of sustainability for which I use the definition "balancing the positive effects of lighting on living beings with the impact of that lighting on the environment". Night-time lighting can contribute to safety, security, and quality of life. As such it is essential for our society. Only professional, carefully designed, lighting that brings the light only there where it is really needed and only when it is really needed fulfils the requirement of sustainability. 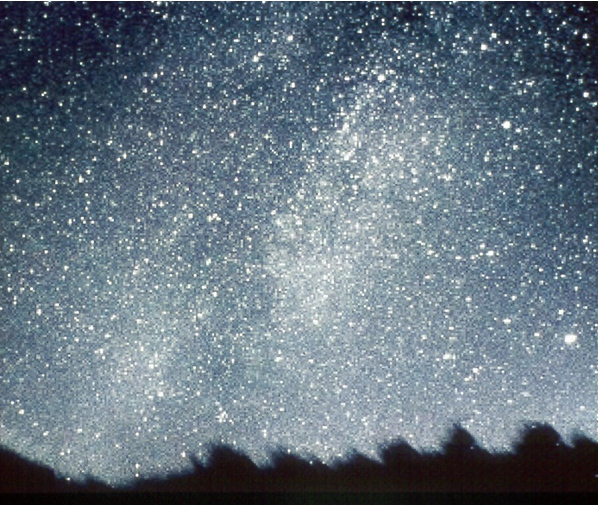 Stars in a dark sky environment. Source: David Crawford. Wout van Bommel has participated in the work of a Technical Committee of CIE (Commission Internationale de l'Eclairage) that published in 2003 the Guide on limitation of obtrusive light. Representatives of the International Dark-Sky Association (IDA, of which van Bommel is a Board member since 2008) have also contributed. This guide has been used as a basis for national recommendations on light pollution restriction in many different countries. Especially with the rapid growth of LEDs in outdoor lighting and with more insight in the technical details of light pollution, the recommendations have to be revised. Wout van Bommel was board member of IDA in 2008 and 2009.